Another day, with more arts to share! 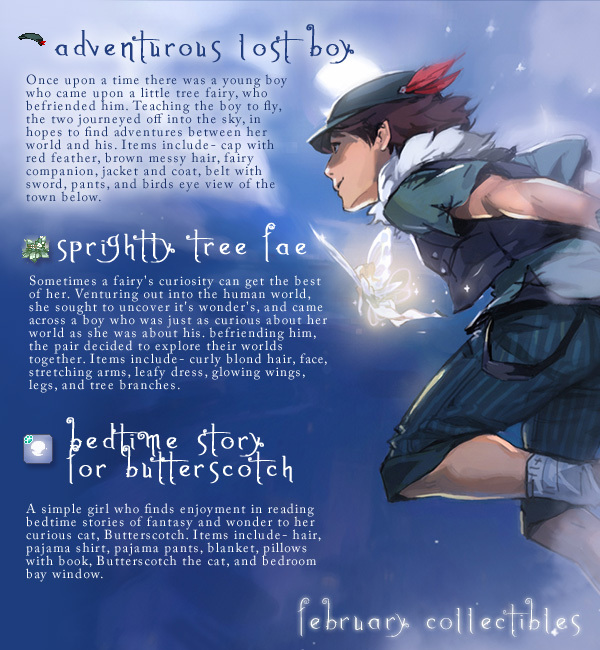 This time, we have, well, a peter-pan inspired character.- at least that was the general theme I was working with. This was a quick painting, and aligns more to my anime-style of painting. Depending on what I’m working on, or who I’m doing work for, my style tends to shift between semi-realism, and this style. This one in particular, accompanied the work I did for Gaiaonline.com for February’s Monthly collectibles, and these are the items I pixeled, and my illustration that tells a little bit about each character’s set of items! Welp, that’s it for this post! But more coming soon 😀 Hope you liked it, and as always, till next time, Enjoy!